If you’re looking to add cleantech stock to your portfolio, is there anything to buy beyond Tesla Inc. (TESLA)? If you’re a startup cleantech or clean transportation company, is going public viable for your financial future? Tesla’s stock price and market valuation grabbed a lot of attention last week, with the irony of its market capitalization rising over $49 billion versus Ford Motor Co. (F) being at $44.63 billion (as of late Friday). Ford’s shares were trading at $11.23 and Tesla closed Friday at $302.54. Not bad for a company that’s never earned a quarterly profit. 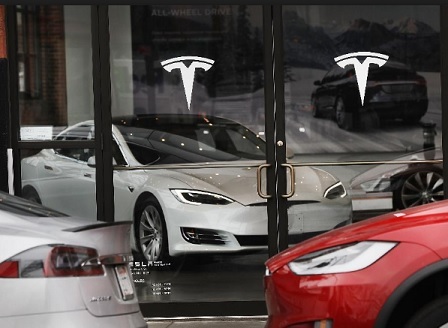 It continued into yesterday with the Tesla stock climbing 3.3% Monday to $50.9 billion in market capitalization, eclipsing General Motors (GM) to become the highest ranking automaker in the U.S. – not in vehicle sales but it market valuation. Tesla is within $1 billion of Honda and making it into the top five global automakers in market value. Some critics worry that Tesla has become a cult of personality around charismatic CEO Elon Musk; while others see the real value coming from the quality and performance of the Model S and Model X and the impressive figure of bringing in over 400,000 pre-order down payments last year on the Model 3; not to mention Superchargers and Tesla Energy. A few Wall Street analysts are worried Tesla won’t be able to hold a stable financial position in the next couple of years as it ramps up to produce more than 500,000 vehicles a year and increases its debt. There’s also the big question of whether the SolarCity merger was a wise way to go. The latest stock surge is a clear sign that electric vehicles are being seen as an integral part of transportation’s future – with Tesla well positioned to tap into it. If you look at cleantech stocks or take a visit to Alternative Energy Stocks, you’ll find it difficult to locate stocks that are growing in price and have market valuation anywhere near Tesla’s. Leading solar power company SolarCity had been doing very well in stock market performance up to about a year ago, but then started seeing its stock value plummet. The company was facing a few serious hurdles, which prompted the company to merge late last year with Tesla. That meant SolarCity stock was no longer listed in NASDAQ market quotes. Green Auto Market Extended Edition tracks stock performance on a monthly basis. Tesla is the only publicly traded company on the list that has over a billion in market cap, though SolarCity used to be on that list. Vivint Solar, the second largest solar power company in the U.S., was looking very good about two years ago in stock price increases and market value. It had been split off from parent company Vivint Smart Home and was doing well after its IPO. SunEdison was going to acquire the company last year, but the deal fell apart, which brought stock prices down. The two Vivint companies are partnering now to go after more market share dominated by Tesla’s SolarCity; and that includes increasingly popular smart-home tech offered by companies like Vivint. Some companies tracked in Alternative Energy Stocks have only a small portion of their business in cleantech. AeroVironment, Inc. (AVAV) is a good example. While it plays a leading role in bringing electric vehicle charging stations to the U.S., that segment of the company’s revenue pales in comparison to AeroVironment’s role in aerospace. About 10 years ago, cleantech stock and private equity funding was a hot commodity with renewable energy and electric car startups gaining backing. That took a dive after the Great Recession grabbed hold and venture capitalists and institutional stock fund managers started looking elsewhere, such as mobile device applications and Silicon Valley tech firms. Government grants, especially through the U.S. Department of Energy, filled some of that void for a few years. It became a battleground in Congress, and 2012 Republican presidential candidate Mitt Romney used the public funding and bankruptcies of solar startup Solyndra, plug-in hybrid sports carmaker Fisker Automotive, and lithium battery company A123 Systems as campaign fodder against President Obama. Private equity has filled some of the void, with much of it coming from China. Wanxiang Group, a major auto parts supplier, has helped salvage and rejuvenate Fisker and A123 Systems through post-bankruptcy acquisitions. Karma Automotive is now using the Fisker Karma drive train system in its Karma Revero plug-in hybrid sports car. A123 Systems has switched over from lithium iron phosphate to nickel manganese cobalt (NMC) technology to meet the market demand for advanced battery chemistries in high energy applications, some of which will include plug-in vehicles. A lot of the company’s focus lately has been on 48-volt batteries. Some of the investments coming from China aren’t working out so well. U.S.-based startup Faraday Future is owned by LeEco and Chinese tech entrepreneur Jia Yueting. LeEco has faced its own set of financial problems and may be backing away from Faraday Future at this time. LeEco is a major investor in another electric car startup grabbing a lot of attention these days. California-based Lucid Motors is looking for $700 million to establish its Arizona factory and build the “Air” electric luxury sedan. Lucid claims that the Air will go 400 miles per charge through two AC induction motors capable of producing 1,000 in combined horsepower. Lucid Motors is now working on a Series D financing round. Once that funding is secured, ground will be broke on its production plant. It will carry out the process gradually in three phases. For those interested in filling out their stock portfolio with companies getting good marks in sustainability performance, it might be a good idea to look at the supply chain and tech company partnerships. Johnson Controls International (JCI) is getting strong sustainability ratings, and is considered to have tangible value on the stock market. The company has been included in 40 sustainability indices in recent years and claims to have reduced its greenhouse gas emissions intensity 41% from 2002 to 2014. JCI is a leading supplier of batteries for hybrids and EVs, along with being a recycler of lead-acid batteries; and a large producer of automotive electronics and parts such as seats and instrumental panels. It’s also well known for being a leading provider of energy management products and HVAC for buildings. Renewable Energy Group (REGI) has been finding supporters, including a stock market analyst making annual recommendations to Renewable Energy World. The company has becomes a leading producer and seller of biomass-based diesel in the U.S. Turbulence over renewable fuel standard credits and low oil prices have hurt the company and many others, though the company’s fuel and stock prices are finding more backers in the market. The company is also doing well through a Services department that provides facility management and operational services to biofuel and cleantech facilities. Several major automakers and their supply chain partners have been working on using less energy and water in their factories and other facilities. Ford just made the World’s Most Ethical Companies for the eighth year. The automaker was acknowledged for making Partnership for a Cleaner Environment (PACE) part of its ethics and sustainability drive. That program was set up to encourage sustainability practices, including water and energy conservation, throughout its global supply chain. General Motors (GM) now has 122 landfill-free facilities around the world that recycle, reuse or convert to energy all waste from daily operations, about three fourths of which are manufacturing plants. The company has committed to using 100% renewable energy by 2050. Last year, Toyota Motor Corp. (TM) launched a six-phase sustainability initiative through 2050. Along with clean energy and water efficiency, the company says that 100% percent of its new vehicles sold that year will be zero emission. Tech companies like Apple, Google, and Facebook have gained a lot of backing supporting their share prices. They’re also heavily engaged in powering their facilities with clean energy, as detailed in a 2GreenEnergy blog post. Apple and Facebook clouds are powered by renewable energy. Amazon’s web service, which hosts Amazon.com, Pinterest, Netflix, Spotify, and many other major websites, said it will utilize 100% clean energy for its global network. You can also take a look at Cleantech Group’s list of companies and weightings for those included in the Cleantech Index. There are no automakers on the list, but a few suppliers and tech companies are being followed including Siemens, ABB, Schneider Electric, Johnson Controls, Borg Warner, Trimble Navigation, Intertek Group, and engineering firm Ricardo. Tesla has been wise to tap into just about every imaginable source of funding out there, short of crowdfunding (unless you want to put the $1,000 down payments for the Model 3 in that category). The electric carmaker took a Department of Energy loan that it paid back early. Its stock market value continues to be strong with Musk continuing to be the largest shareholder in the company. Musk has said that Tesla could likely have disappeared if it weren’t for significant investments made by global automakers Daimler and Toyota in 2009 and 2010. Both of these companies have sold their shares in Tesla for excellent profits. They did tap into Tesla’s electric drive system for some of their first steps into electric vehicles before ending the partnerships. Like many automakers, China will be a vital growth more for Tesla in the future. Musk had said China will someday become Tesla’s largest market, and the company just reported making $1 billion sales last year in that market. A Chinese company has also become one of the largest investors in Tesla. Chinese tech giant Tencent Holdings just invested $1.78 billion, or about 8.2 million shares, making it Tesla’s fifth-largest shareholder. The first four largest shareholders are Musk and investment companies Fidelity, Baillie Gifford, and T. Rowe Price. Tesla needs strong cash flow to get the Model 3 launched in high volume. Tencent wants to diversify its portfolio and is a big believer in how sizable EVs and the charging infrastructure will be. The company has been investing in Chinese EV startups. One of these, NextEV, also has a U.S. office near Tesla’s Palo Alto, Calif., headquarters, and is committed to rolling out an electric supercar that will be Tesla-competitive. This entry was posted in electric vehicles and tagged tesla. Bookmark the permalink.